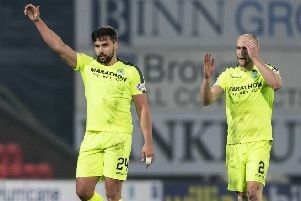 Kevin Thomson is unlikely to be parachuted into the Hibs side for Saturday’s crunch match with Motherwell despite boss Terry Butcher facing a midfield crisis. Scott Robertson, Owain Tudur Jones and Duncan Watmore have all been sidelined by injury while Tom Taiwo is suspended after being sent off in the defeat by Dundee United. Thomson last featured in a top-flight match as a substitute in the 0-0 draw with St Johnstone more than two months ago but played for the Under-20s against United last Tuesday and against Burntisland Shipyard in the East of Scotland League last weekend. But while the 29-year-old has expressed his determination to force his way back into Butcher’s plans, the Hibs manager believes he has yet to attain the level of fitness required to play in the Premiership. The loss of Robertson and Tudur Jones, who are both long-term injury victims, and Taiwo leaves Butcher seeking a central midfield partner for skipper Liam Craig, while Watmore is “still some way off” as he battles the foot injury sustained on his debut against Raith Rovers. Butcher, however, will have to wait until tomorrow before being able to finalise his side with Ryan McGivern having played the full 90 minutes of Northern Ireland’s friendly in Cyprus last night and not due to return to his club until later today.